The TI is explicitly non-local and thereby consistent with recent tests of the Bell Inequality, yet is relativistically invariant and fully causal…The TI permits quantum mechanical wave functions to be interpreted as real waves physically present in space rather than as “mathematical representations of knowledge” as in the [Copenhagen Interpretation]. The TI is shown as to provide insight into the complex character of the quantum mechanical state vector and the mechanism associated with its ‘collapse’ (Cramer, 1986, pp. 647-648). These are ambitious claims. How does it work? is a double wave linking the emitter and the aborber made up of half of a retarded wave carrying positive energy into the future, and half of an advanced wave carrying negative energy into the past…because two negatives make a positive, this advanced wave adds to the original retarded wave as if it too were a retarded wave traveling from the emitter to the absorber (Gribbin, p. 238). As if this wasn’t difficult enough, Gribbin notes that this transaction can happen in the other direction as well, originating in the future. All of this gets hideously complex in trying to imagine. Perhaps an illustration can simplify things a bit. This transaction between electrons happens instantaneously. At first, the idea of sending a wave back in time may sound ridiculous, and the instantaneous nature of the quantum “handshake” to be pushing things a bit. Yet upon examination, this may not be as counterintuitive as it seems. Leaving aside, for the moment, the vagaries of subjective time as explored in the introduction to this paper, let us, for a moment, revisit Einstein’s Special Theory of Relativity. The Special Theory of Relativity links space and time into a continuum – spacetime. Furthermore, Bell’s Theorem and the experiments of Alain Aspect have shown that particles can become “entangled,” and behave in a manner that suggests nonlocality in the universe. Locality is a spatial description. If space and time are linked, then atemporality is merely a way of describing a different aspect of the same phenomenon. 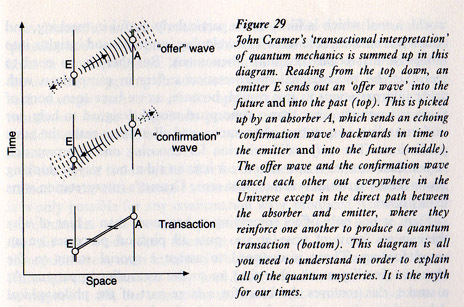 Indeed, Cramer has emphasized that his model is no different from “regular” quantum mechanics. It is only offered as an alternative conceptual framework (Gribbin, p. 239). Yet re-conceptualizing quantum theory in this manner opens up discussion of a number of topics, not the least of which is the idea of precognition. If there can be this exchange of information between the future and the present or the past (whatever these might now be), is it possible to “tap into” this process, and know about events before they happen? In his introduction to what has been called the worst movie ever made, Plan 9 from Outer Space, television psychic Jeron Criswell reminds us that “We are all interested in the future, for that is where you and I are going to spend the rest of our lives.” Throughout history, humanity has sought to know the future, utilizing the services of oracles and fortune tellers, or by using any number of divinatory tools, from animal entrails to tea leaves, to palm reading, to the I-Ching. History is full of anecdotal stories of people who could “see” the future. Are the reports of these seers merely lucky guesses? Coincidences? To begin this discussion, we will next look to some of the research being conducted to determine if such precognition is even possible. Up next: My Presentiments, Exactly! Cramer, J. (1986). The Transactional Interpretation of Quantum Mechanics. Reviews of Modern Physics, 58, 647-648. Gribbin, J. (1995). Schrödinger’s Kittens and the Search for Reality: Solving the Quantum Mysteries. New York: Little, Brown and Company.